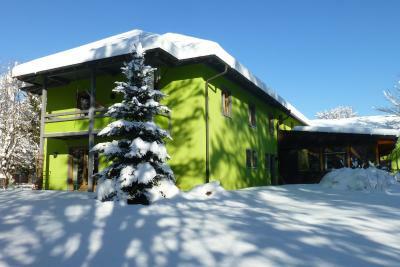 Lock in a great price for Jugendherberge Füssen – rated 8 by recent guests! 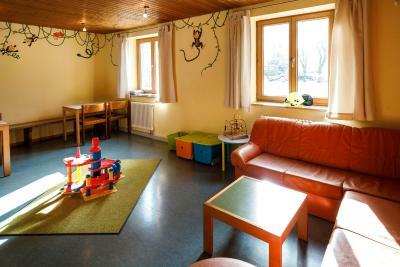 Very good location, close to the Neuschwannstein Castle. Clean property, friendly staff. Simple but nice breakfast. Clean bathrooms, very nice shower. It's very worth for couples and solo travelers. It was easy and convenient to get to from the town. The breakfast was good and people were friendly. The best hostel I have stayed at! The bed is really comfortable, you have your own bed lamp (of good quality) the locker in the room is really big and the buffet breakfast is really good. 15 minute walk from city center. Also they offer free (1 euro deposit, but you get it back) lockers to store your luggage either before check in or after check out, and it is a really big locker. Good WiFi. 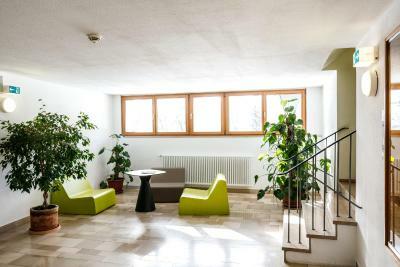 Good location: 10 minutes walking to train station, 15 minutes to the old town. Good buffet breakfast. Very clean. 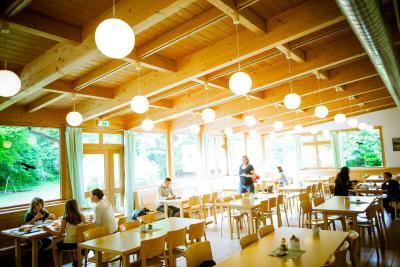 The large common room. The locker storage downstairs was nice. The twin room has private bathroom and shower, which is really convenient. We really enjoyed the complimentary breakfast. 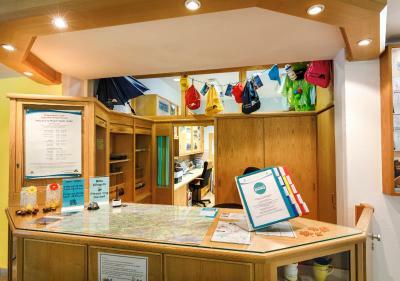 The front desk is very helpful with travel information. We visited the Wies Kirsche, which is a unesco site, after our stay at the hostel and the lady at the front desk helped us to look up the bus timetable information. We also recommend the Bella Pizza Delivery Service, which provide very delicious italian pizza and pastas carry out food, and you can order and eat there as well. Good quality breakfast n friendly, helpful staffs. The location is on the edge of town which lets you benefit from a short walk into the historic centre where there are great places to eat. A small town with a lovely atmosphere. 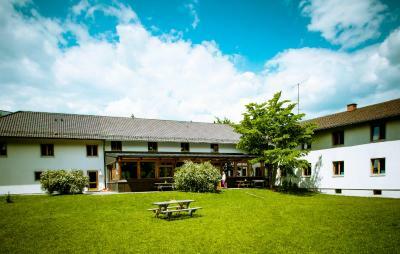 This hostel in west Füssen is a 10-minute walk from the historic St. Mang’s Abbey and Füssen Train Station. Laundry facilities and free Wi-Fi are offered. 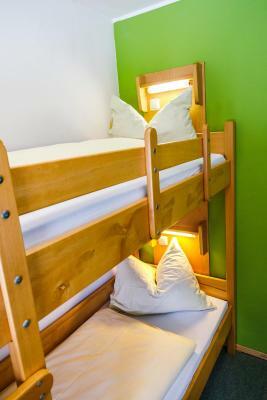 Rooms at the Jugendherberge Füssen Hostel offer wooden furnishings. 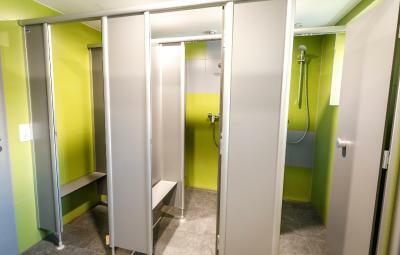 The dormitory-style accommodations comes with a shared bathroom in the hall. A breakfast buffet is provided and dinner is available in the dining room. 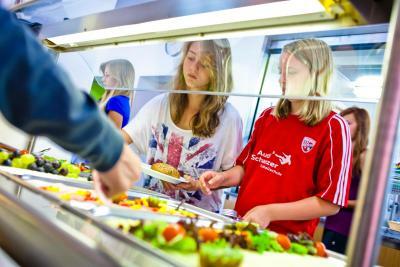 Guests can also get snacks and drinks from the vending machines, and enjoy use of the barbecue facilities. Jugendherberge Füssen is 2.8 mi from the Neuschwanstein fairytale castle. 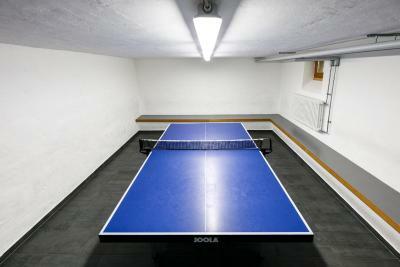 The hostel has a games room, and also offers the chance to play table tennis and table football. Füssen Train Station is only 0.6 mi from the hostel. 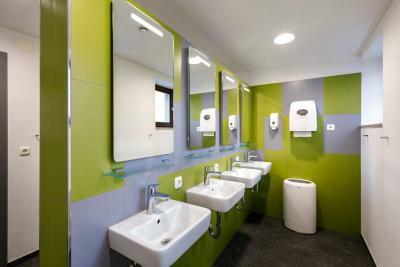 The A7 motorway is 2.2 mi away and on-site private parking is provided. 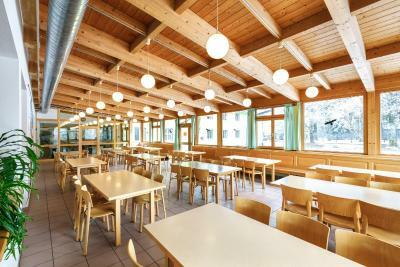 When would you like to stay at Jugendherberge Füssen? Simply furnished room with a safety deposit box, a sink and a shared bathroom. Simply furnished room with safety deposit box and shared bathroom. Simply furnished room with safety deposit box and private bathroom. House Rules Jugendherberge Füssen takes special requests – add in the next step! Jugendherberge Füssen accepts these cards and reserves the right to temporarily hold an amount prior to arrival. 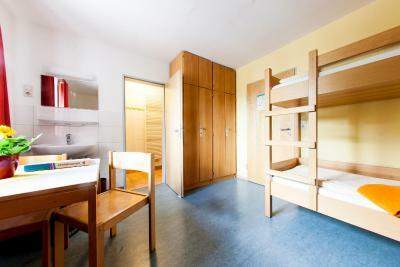 Guests staying at the hostel must be a member of the Deutschen Jugendherbergswerk or the Youth Hostel Association. Membership can be purchased at the accommodations. A one year's membership for German nationals can be purchased at the property for EUR 7 for guests under 27, or EUR 22.5 for guests 27 and older and for families. International guests can purchase a daily membership for EUR 3.50 ( for a maximum 6 nights, which pays for an annual membership). This is an additional policy specific to the property, in addition to the standard policies. Guests over 27 must pay an additional EUR 4. One of the most picturesque neighborhoods in Füssen! The heaters in both the bathroom and suite did not work on demand. The rooms are also all facing each other and any movement reverberates through the dorm. Very hard to sleep! Everything as expected. Breakfast was amazing!!! Staff is very friendly. For a family of 4, the price was comparable to a simple hotel in the area. You own have to take the bed sheets and make the bads, and before the checkout you must leave the linen and take it under the main stairs. Towels are not included. The price is very high for an hostel. Clean, close the city center, good breakfast, good shared area. No wifi signal in the room. The room was extremely small for 4 persons so it's only good for sleeping in. Only two toilet cubicles and one bathroom on our floor. Free parking space. 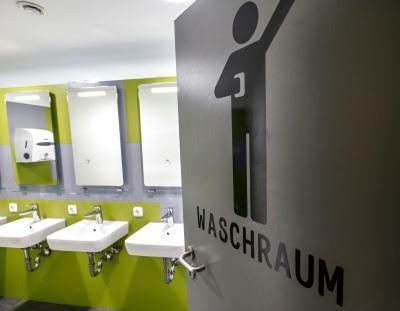 Clean toilets and bathroom. Breakfast is ok. The staff gave me useful tips and good directions recommendations. Parking was an issue. I hated that the pillows made so much noise, the showers were always occupied, the Internet was extremely slow as everyone would use it at the same time and it would slow waaaaaay down. The beds were very loud if you moved an inch.